When you move the lever in the gate to select a position, the corresponding indicator is displayed in the instrument panel. 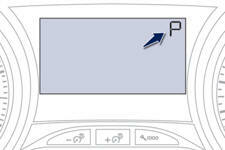 Press the brake pedal when this indicator lamp is displayed in the instrument panel (e.g. : starting the engine).